Everyone has a bucket list. You know, the things that you would love to do before your time on this planet is over. It could be as rare as an exotic trip to a rare place, it could be as common as seeing an ocean. It could be as adrenelane pumping as jumping from a perfectly good airplane, it could be as calming as sitting in front of a warm fireplace reading a book in the middle of uncivilized wilderness. Watch a ball game in a stadium of all the active MLB teams – Currently, there are 30 MLB teams. I have visited 9 total stadiums of different MLB teams. Two are no longer active (Old Yankee and the Metrodome). I’m hoping to knock at least 2-3 more off the list this season, but I have a long way to go before completing this one. Unlike, this guy who did all 30 stadiums in 26 days. I bow to that type of devotion. Attend Spring Training – It doesn’t matter if it’s the Cactus or Grapefruit league, Spring Training is a must for any baseball fan. For an added bonus, see all 14 (or 16) teams on one Spring Training Trip. That’s only a week or so vacation if you can watch a carefully planned 7-8 games in that time frame. Attend an All-Star Game – What better way to see all the great baseball players of a season than in a single game competing against each other? Add more bonus points to your bucket list if you attend the HR Derby and sit in the outfield attempting to catch one of those Gold home run balls. Attend a uniform number retirement ceremony – I’ve never been to one (simply because the Brewers don’t retire numbers often), but I’ve been to a few farewell ceremonies. One I can remember was a tribute ceremony for Greg Vaughn, and it was neat to see an entire career highlighted in a single night. I can only imagine what ceremonies retiring numbers belonging to Greg Maddux, Cal Ripken, and Nolan Ryan must be like. Catch a ball during an MLB game – I’ve been very close to several in my lifetime but have never felt one strike my own fingers. This is the ultimate memento to a game, and hopefully when my chance comes, there aren’t any little kids sitting around me so I don’t have to be pressured into giving it to them (or even worse, pressured into throwing it back). You get bonus bucket points for catching a home run. Witness a rare statistical event – How cool would it be to watch a player hit 4+ home runs in a single game?! How many times will you see a player hit for the cycle or watch a pitcher throw 20+ strikeouts?! 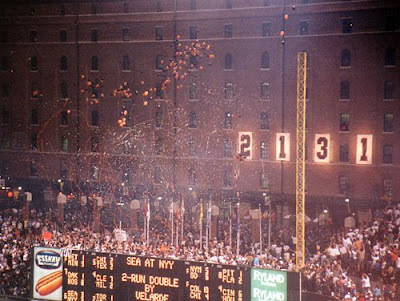 How unbelievable would it be to watch a no-hitter… no even better, a perfect game?! (Or two). Or watch someone break a 30-year old Home Run Record?! Or probably the most rare, watching an iron man surpass the most consecutive games played?! Attend a double-header – Double-headers are a rare commodity these days. Typically it’s due to a rain out and you have to buy 2 separate tickets. If you ever find a traditional double-header requiring a single ticket, jump on the opportunity to see 2 games back-to-back. Follow your favorite team through the playoffs – I’ve been to 3 playoff games and there isn’t anything close to the experience when it comes to watching a baseball game. Home or away, every single fan is watching every pitch. There are no beer runs, there are no mid-pitch potty breaks. It’s 45,000+ fans on the edge of their seat at all times. You can even get bonus points for attending their World Series run and even more if you attend the game they clinch the World Series title. Get a player’s autograph – Autograph’s can be acquired 2 different ways: personally or purchased (gifted = purchased). Both are great ways to collect your favorite all-time players and remember great baseball memories. My favorite purchased autograph is a game used Jose Hernandez bat. Yes, Jose Hernandez. He is the player that got me hooked back on Brewer baseball as he was chasing the single season strikeout record as a batter. However, the memories coming from an autograph where you handed the player the pen are irreplaceable. I can still remember getting the ball from Bret Saberhagen after he threw it into the fence during warm-ups at County Stadium. Or sitting next to Mike Dunleavy and his young son and asking him to sign a baseball (this was at the Vaughn tribute game I mentioned above… crazy how memories work). Sit in the front row behind home plate – I had a rare opportunity to sit front row one section from directly behind home plate and I can tell you that there are no better seats to watch a ball game live. You are feet from the players and the action. You can feel every fastball. You can see every curveball. You can hear the umpire’s play-by-play. It’s an amazing spot to watch a game with all the other diehards. Witness the first or last pitch in a stadium – Could you imagine being at old Yankee Stadium on the final pitch? Imagine if the grass, the outfield walls, the bases, the seats could talk… what would they tell you? Maybe they would tell you about Roger Marris hitting his 61st home run of the 1961 season. Maybe they would tell you about Mr. October hitting 3 home runs in the 1977 World Series. Maybe the story of Don Larsen throwing a perfect game in ’56 World Series. Or maybe about ‘The Pine Tar game’ when George Brett was thrown out of the game after hitting what would be the game winning home run. Or maybe about the first home run ever hit inside Yankee Stadium by none other than Babe Ruth. Could you imagine being at the first pitch of new Yankee stadium? The memories, the legacies, the players that will be going through there. Watching greats like Mariano Rivera, and Derek Jeter retire. Yeah, that would be cool to witness the end or start of a stadium legacy. Whether it be Fenway, Wrigley, Dodger, or even Miami’s stadium, each stadium brings their own collection of memories. Make a Sportcenter Highlight – Did you catch your foul ball with a baby in one had? Did you duck for cover and let your lady friend take one off the face? Did you jump on the field to hug Jeter? Did you start the collapse of a team’s curse breaking season? Whatever you did, you got to see yourself on the big screen at home and are immortalized on your DVR forever. Watch a game from an iconic seat – Everyone knows of the ‘Bartman Game’ at Wrigley. And that seat has become a popular place for a photo recreation, but what about watching an entire game from that seat. You may get to actually recreate the controversy. Several stadiums have these types of seats. There’s the Ted Williams seat at Fenway (I would even count the Green Monster as an iconic seat). Arizona has the pool out in right field. San Francisco has the chain link fence in the right field boardwalk (A kayak in McCovey Cove would be sweet as well). Colorado has the Purple Row at 1-mile high. Maybe the Western Metal Supply building at Petco Park. Or maybe the dollar Uecker Seats at Miller Park. Standing room only out in the Kauffman water fountains. I’m sure I’m missing some others but my bucket list would probably contain games from the top of the Green Monster or in a kayak in McCovey Cove. Throw out the first pitch – I can’t even imagine… but if a robot, dinosaur, wookie, and bigfoot can do it, why can’t I have a shot?! So what did I miss? What’s on your baseball bucket list (or already crossed off your bucket list)?